Lindsay Mason: Cardstock made simples! Sorry that I didn't manage to get any pictures of my card samples up here before the weekend. What with bad light and lack of time, it just didn't happen. I'll definitely have some to show you soon I promise! 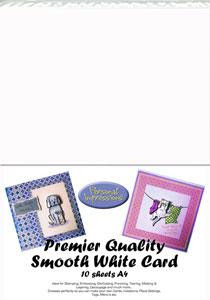 This first one is Personal Impressions Premier Quality Smooth White Card, which is available in packs of 10 or 100 A4 sheets. This is my favourite, all purpose cardstock which weighs in at 200gsm and is ultra smooth and brilliant white. 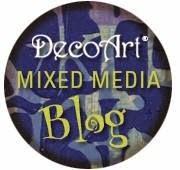 I use it for drawing my stamp designs on, as well as for creating pop up inserts and stamping onto. It's thin enough to be able to cut around stamped images easily but sturdy enough that it holds up well for decoupaging them. You'll get crisp images when you stamp onto it and the brightness means that colours look clean. Next is the newest card in the personal Impressions own range. There isn't a picture of this cardstock as it doesn't come in a labelled pack as the others do. However, this one is a real gem of a cardstock and is called PIP300CWH....catchy eh?! It stands for 300gsm card white. Your local shop can get this if they don't stock it and it's usually sold in single A4 sheets or packs of between 10 and 25 sheets. It feels less smooth than the previous card but it has almost magical qualities to enhance your stamping and distressing work. You'll find that Distress inks blend beautifully and, what's more interesting is that, spritzing with water, or brushing water on, will give you the most dramatic faux bleaching effects. If you blend dark colours over the surface and then stamp a figure over them it may look great except for a deep blue face! Simply paint the face with water, dab with a paper towel and the face will really "pop" white again for you to colour as you wish. This card actually keeps water based inks wetter for longer, so is ideal if you want to stamp onto it with a Big n Juicy Rainbow ink pad and then brush water across for a blended effect. In fact, you may even want to heat set the ink slightly first - much better than having to quickly grab the brush in a race against time in case the ink dries! Really fabulous card that I am so glad to have to hand all the time. 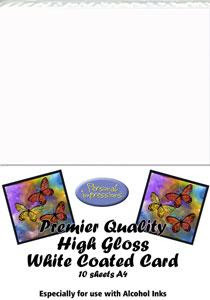 Next in my "must have" selection is the Premier Quality High Gloss White Coated Card - see below. The word "coated" is the key here, as it behaves differently from standard gloss card or photographic gloss card. This is the ideal surface for using with alcohol inks...I especially like to use them to make mono prints by drizzling the inks onto my craft sheet, adding a little Blending Solution and then pressing the card onto the surface, moving it around a little and then lifting it away. However, I also recommend it for stamping onto. I use either Stazon or Archival inkpads (if using Archival, remember to quickly heat set it before colouring) to obtain really detailed prints from my stamps. If you find silhouette stamps can sometimes be tricky when stamping onto standard card ie if you get little patches of paler, or no ink, then do try this card as you will almost certainly get better results. As for colouring stamped images - water based pens, such as Le Plume or Memento, work beautifully on this coated card. Water based brush pens glide over the surface and blend really well to give seamless coverage. I used this card in the Crafts Beautiful project that I featured in my last post. So, I hope that helps all the slightly confused ladies that were buying the three cardstocks on Saturday and hoping that they would remember what they were each for when they got home! I had a very nice first trip of 2011 I'm pleased to say! I had a good troll around Chester-Le-Street and got some much needed fresh air and a leg stretch...could do with some real leg stretching, but never mind! Then a relaxing evening and a good night's sleep before going to Dainty Supplies. Everyone fell for Rachel's Darkroom Door stamps as I thought they would! Apologies to those who were blaming me for making them leave the shop much poorer than when they went in! Really,really useful info there Lindsay. Thanks very much.